UK Prime Minister Theresa May has been met with frustration on all sides after winning a vote in Parliament that will see her go back to the EU to renegotiate her Brexit deal. It's another Brexit staredown as the clock to March 29 continues to tick. May is looking to make changes to the Irish backstop, the insurance policy written into the withdrawal agreement that ensures there will be no hard border between the Republic of Ireland and Northern Ireland, but also doesn't clear the hurdle of pulling the entire UK out of the customs union. Italy has slipped back into recession after its economy shrank 0.2% in the last three months of 2018. Analysts pointed out that the fall wasn't too much of a surprise, saying Italy never fully recovered from the 2007 financial crash. Italian Prime Minister Giuseppe Conte said on Wednesday (ahead of the statistics being released) that he expected to see a fall. The dip is expected to continue into 2019, he added. Uber said it has suspended its service in Barcelona after the Catalan government imposed new regulations, which prevented passengers from being picked up until at least 15 minutes after booking a journey. “The new restrictions approved by the Catalan government leave us with no choice but to suspend UberX while we assess our future in Barcelona,” an Uber spokesperson told Reuters. Sea-Watch 3, a German NGO rescue boat, has docked at a port in Catania, Sicily, after spending almost two weeks at sea. 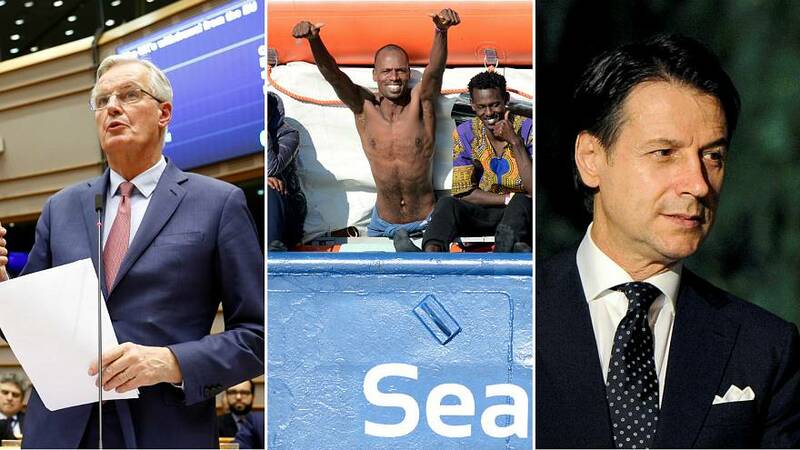 Italian authorities initially prevented the boat from docking at its ports without assurances that the 47 rescued migrants on board would be accepted by Germany and the Netherlands. A deal was eventually struck with six EU member states — France, Germany, Italy, Luxembourg, Malta, Portugal and Romania — who agreed to take the migrants in. In a statement posted to Twitter, a doctor aboard the ship said "Europe should be ashamed" for its handling of the situation. Team Denmark won the Bocuse d'Or 2019 in Lyon, France — the culinary competition known as the Olympic Games of the kitchen. The Danes were up against 23 other countries. Sweden won Silver, and Norway won Bronze. The winner of Best-Themed Platter was Finland and the Best-Themed Dish winner was Bocuse's home country, France. This was the 17th edition of the contest, which was created by the legendary chef Paul Bocuse, who died a year ago. His son Jerome has now taken his place at the competition's helm. Germany's NDR news outlet reported on Thursday that the new channel to allow Europe to trade with Iran had been launched. The channel, called Instrument in Support of Trade Exchanges (INSTEX), will allow trading between Europe and Iran without violating US sanctions. It was created in order for Europe to maintain its commitments promised in the 2015 nuclear deal. The Wall Street Journal previously reported that the planned mechanism would facilitate trade without direct financial transactions taking place.